Girard-Perregaux unveiled a one of a kind masterpiece during SIHH at the beginning of 2018, a watch that pays tribute to its most important historical timepiece, while simultaneously being a departure from its recent contemporary tourbillons, proving that Girard-Perregaux still excels at haute horlogerie. Modelled on an impossibly lavish 1889 pocket watch – the “La Esmeralda” Tourbillon with Three Gold Bridges – the modern day La Esmeralda Tourbillon à Secret is a wristwatch with a completely hand-engraved, hunter-style case. Invented in 1860 by Constant Girard, who had founded Girard-Perregaux with his wife Marie Perregaux, the tourbillon with three bridges was revolutionary for its time, both visually symmetrical and mechanically linear, giving an artistic dimension to what was then a functional, albeit prized, mechanism. Three parallel bridges, each shaped like an elongated hexagon, held down each of the key parts of the movement, with the wheel train arranged in a vertical line from the barrel at the top to the tourbillon at the bottom. It was said, once upon a time, that Girard’s invention was a reference to the Holy Trinity. Crucially, the ambitious aesthetics of the movement were matched by its incredible precision; many examples even equipped with a chronometer, or detent, escapement. 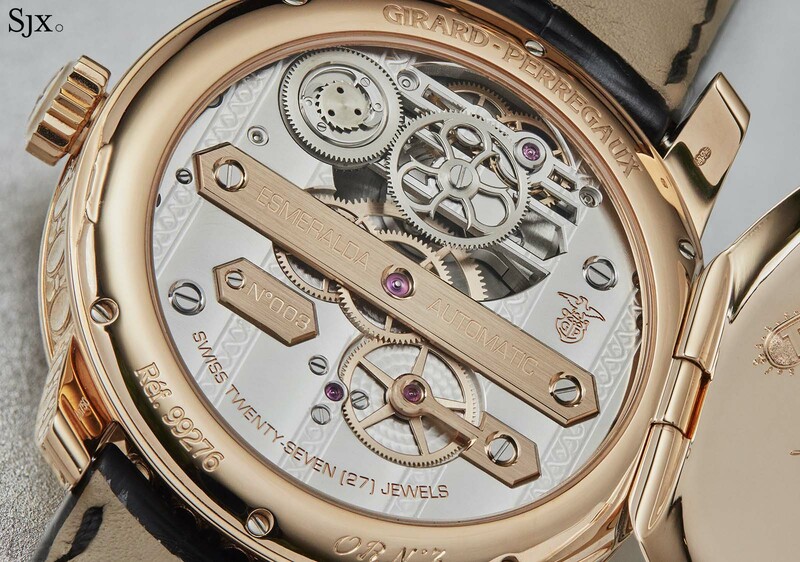 Girard-Perregaux clinched its first award for a tourbillon when the Neuchatel Observatory bestowed a “first class” prize on one specimen in 1867. 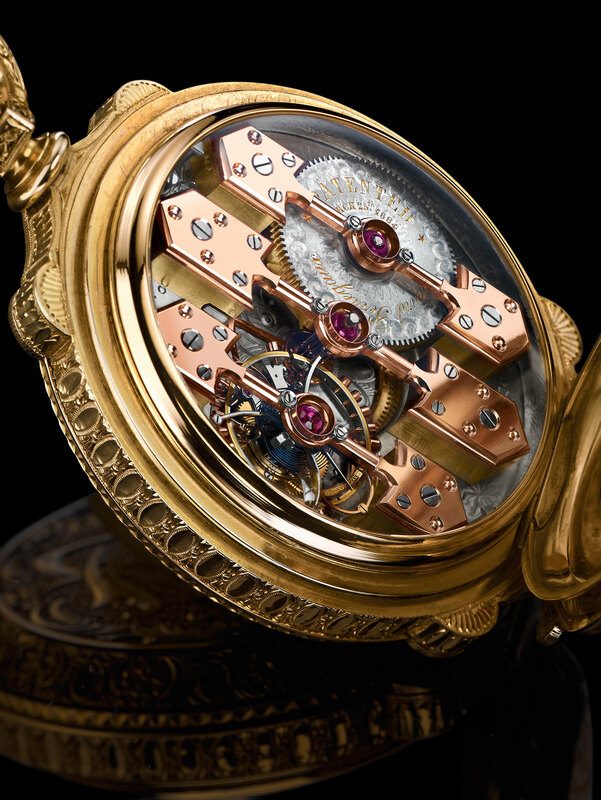 That was arguably the first instance a watch movement had bridged the gap between form and function. The blending of art and science was echoed even in the tourbillon regulator itself, which had an elegantly formed cage with two distinctive horns, a departure from the conventional three-armed carriage, and now the template for all of Girard-Perregaux’s modern tourbillons. Horological academia has recognised the cage as a unique construction in itself; the “Perregaux tourbillon” is classified as a distinct type of tourbillon, alongside the works of Lange, Pellaton and Golay, in Das Tourbillon, the tourbillon reference book written by horological scholar Reinhard Meis. Some of the earlier Girard-Perregaux tourbillon cages were made by noted specialists, including Ernest Guinand, known for his A-shaped carriage. The three bridges were soon refined into three gold bridges, arrow-shaped (or devil’s tail, depending on your inclination) and made of solid gold. Girard filed a patent for the three gold bridges on March 25, 1884 at the United States Patent Office, which granted Girard-Perregaux patent no. 14919. 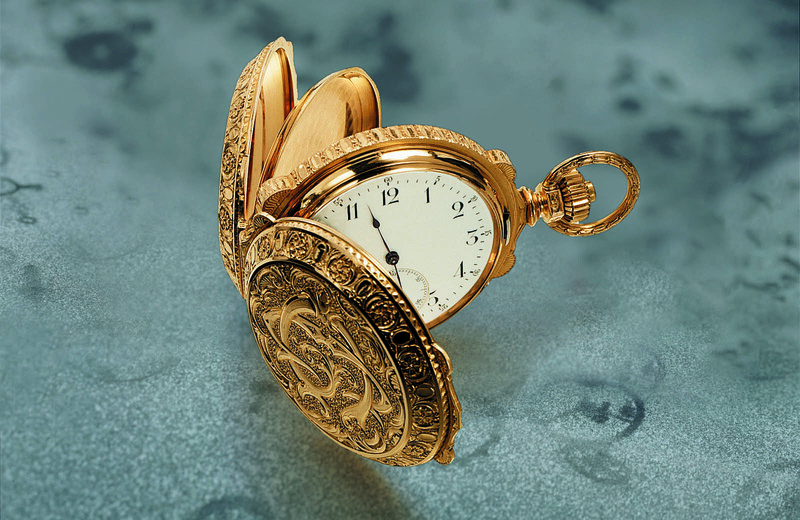 And that same year, Girard presented the first pocket watch to incorporate his ground-breaking movement. 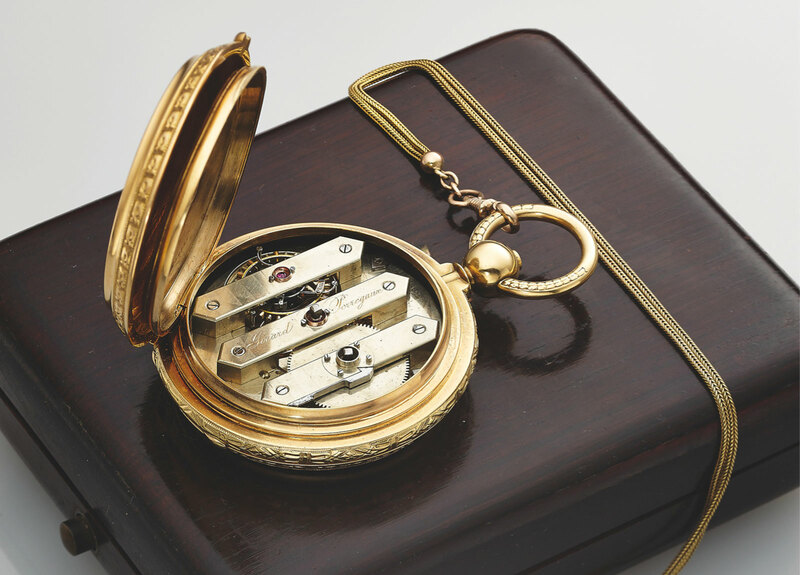 Only about two dozen pocket watches with a tourbillon with three gold bridges were made from the late 19th to the early 20th century, making them exceedingly rare. But the greatest of them all is the one nicknamed “La Esmeralda”, after the Mexican retailer that sold the watch. A no expense-spared creation, “La Esmeralda” was produced for the Universal Exhibition of 1889 in Paris. 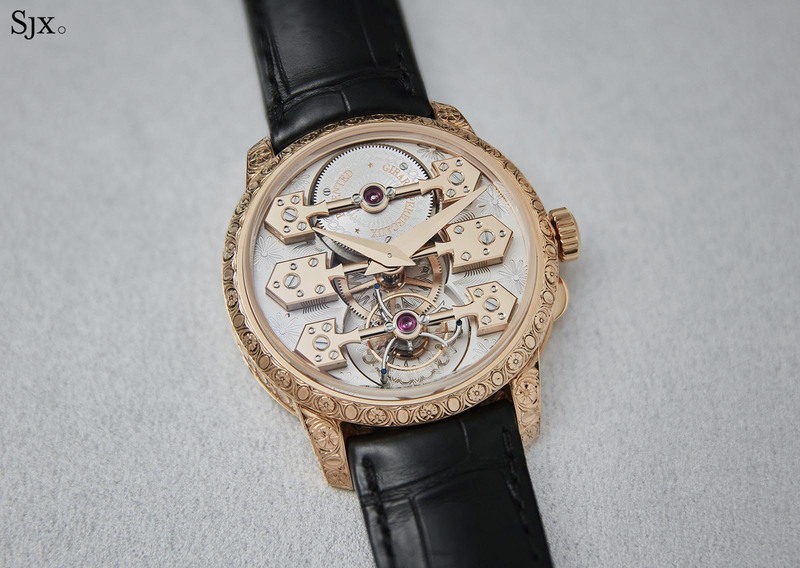 It featured a movement equipped with a tourbillon with three gold bridges, as well as a pivoted, long detent escapement, housed in a massive hunter case magnificently engraved by Fritz Kundert, an artisan and watchmaker in La Chaux-de-Fonds. Naturally “La Esmeralda” won a gold medal. It then travelled to Mexico City, where it was sold by jeweller La Esmeralda, owned by merchants Hauser, Zivy & Cie. The buyer was Porfirio Diaz, President of Mexico, who passed the watch onto his heirs after his death. In 1970, his descendants sold the watch to Girard-Perregaux, and it is now the centrepiece of the company’s museum. 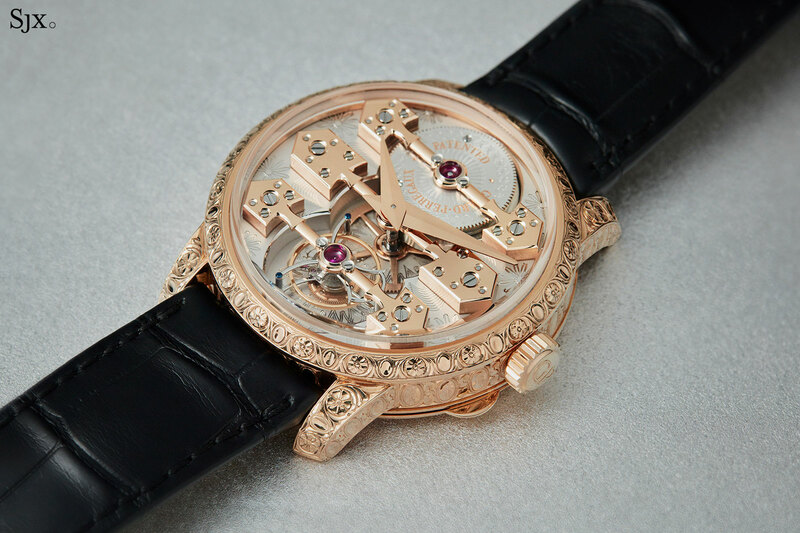 The La Esmeralda Tourbillon “à Secret” is essentially a wristwatch version of the original, the ultimate contemporary interpretation of the three gold bridges. It’s an imposing watch, in both size and style. 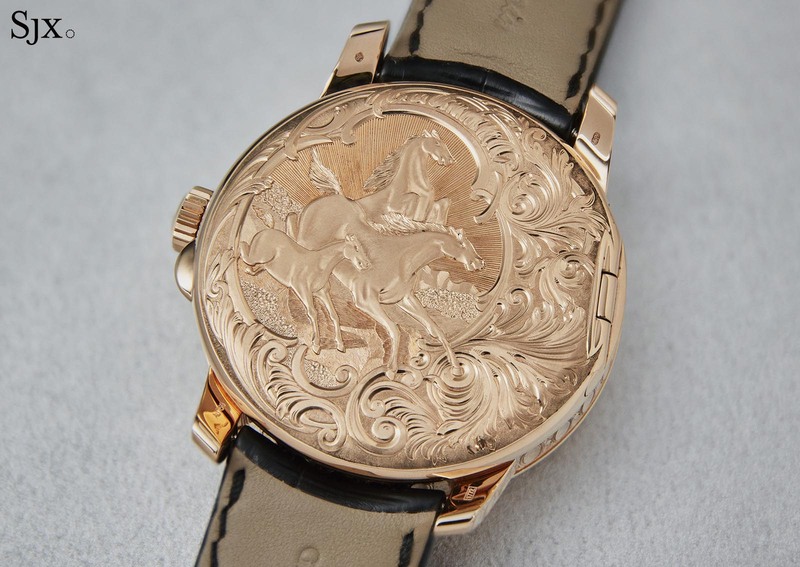 The case is 18k pink gold, 44mm wide and 15.25mm high, and entirely hand-engraved by a single craftsman over some two hundred hours. 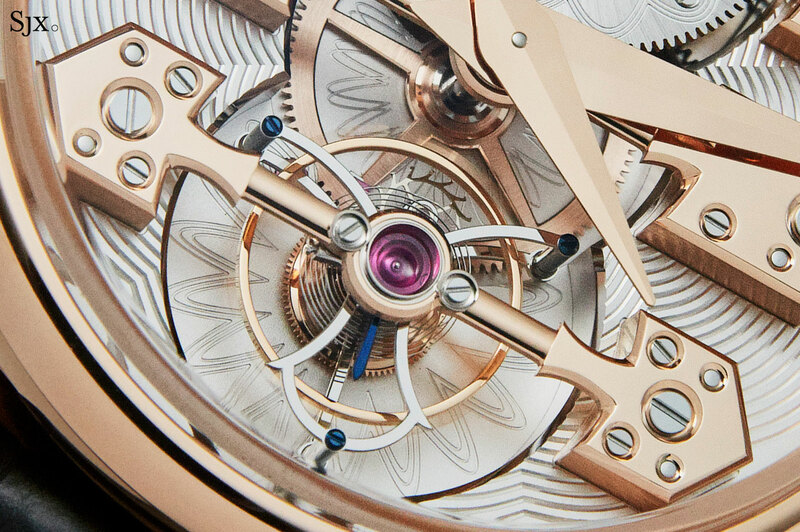 Also in the catalogue, as a regular production model, is the La Esmeralda Tourbillon (ref. 99275-52-000-BA6E), which has a nearly identical movement, but without an engraved case. But back to the unique La Esmeralda “á Secret”: covering almost every surface of the case, the engraved motif draws on the “La Esmeralda” of 1889. 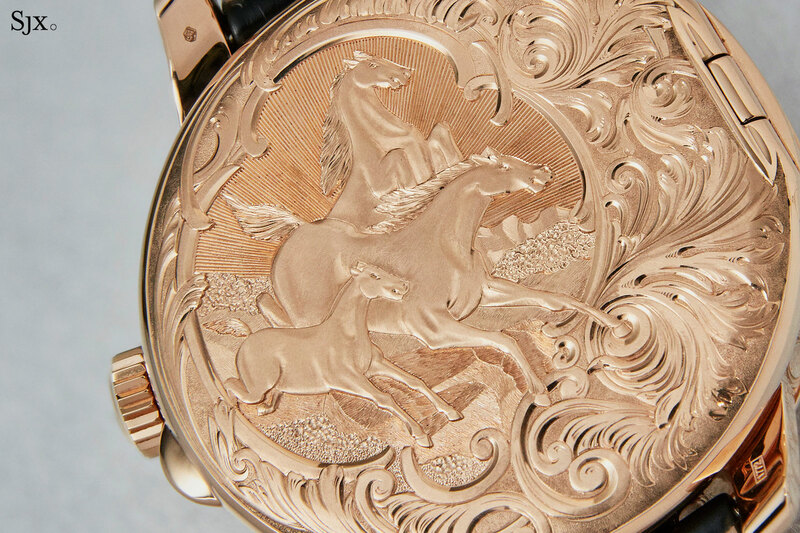 The bezel, top of the lugs and case band are engraved with an floral pattern while the hinged lid on the back has three galloping horses, exactly as on “La Esmeralda”. The “à Secret” nickname comes from the hunter back, which hides the movement. The logo and text inscribed on the inside of the lid is also identical to “La Esmeralda”, with ample room left over for personalisation – handy if the future owner is also a head of state. The La Esmeralda Tourbillon “à Secret” is powered by the automatic version of the three gold bridges movement, the GP09400-0014, which has a 60-hour power reserve. It’s wound by a cleverly hidden is a gold micro-rotor that sits co-axially under the barrel, allowing it to wind the barrel discreetly and directly. As is tradition, the barrel sits at 12 o’clock, with the gear train just below, and the tourbillon at six. 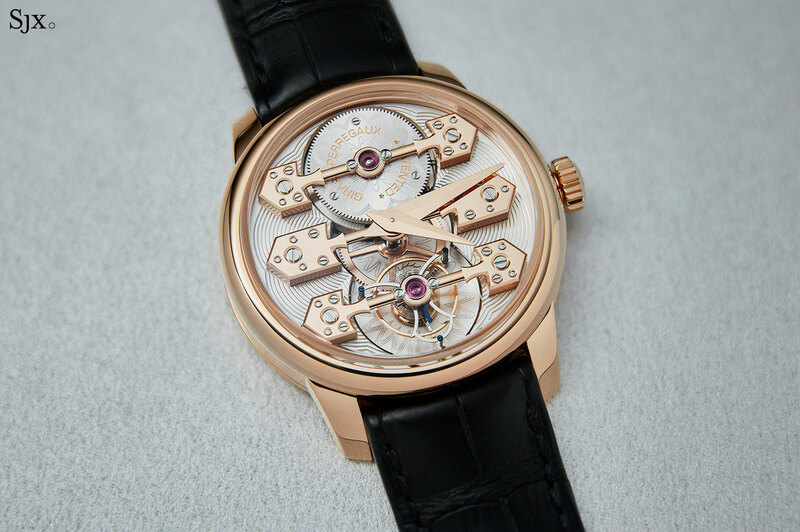 Like all other three gold bridges calibres, the movement is inverted with the bridges on the front and less to see on the back (which is why the hour hand sits on top of the minute hand). 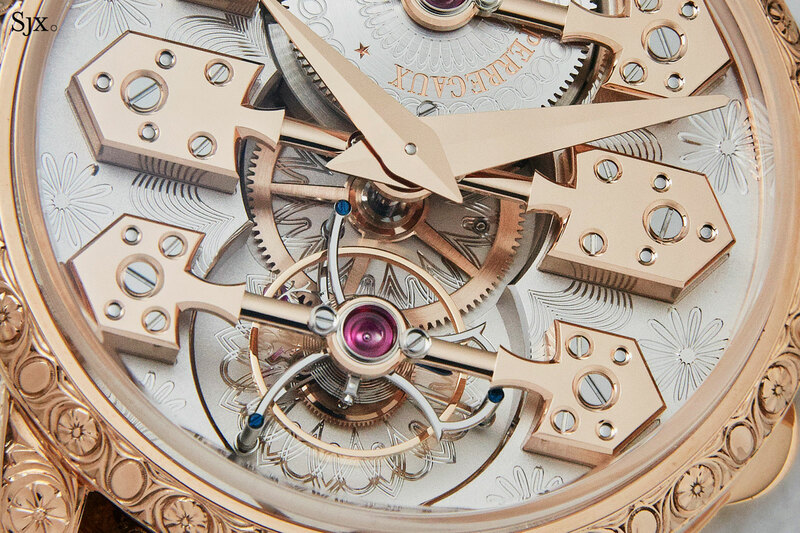 Because the movement sits under a highly domed, “box type” sapphire crystal, the view is panoramic. 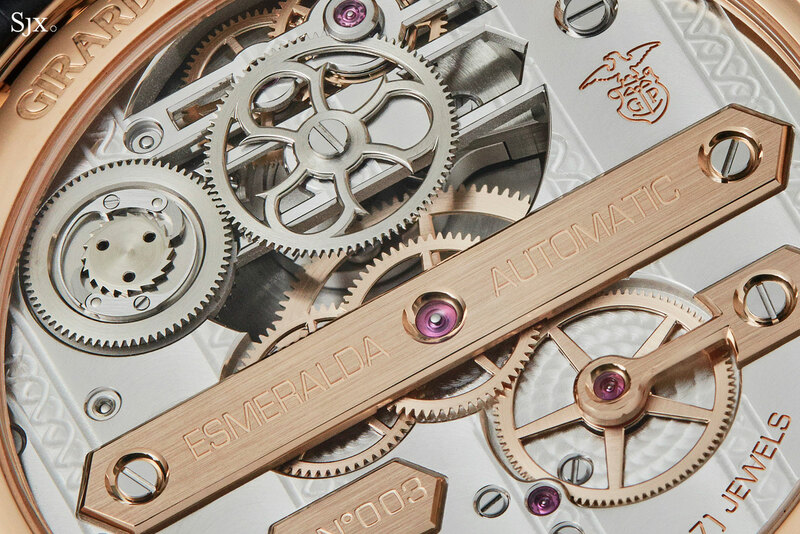 Echoing the historically inspired engraving on the case, the movement is decorated with engraving based on that in “La Esmeralda”. The base plate and barrel cover are both engraved, but unlike the engraving on the case, the movement engraving is done by machine. 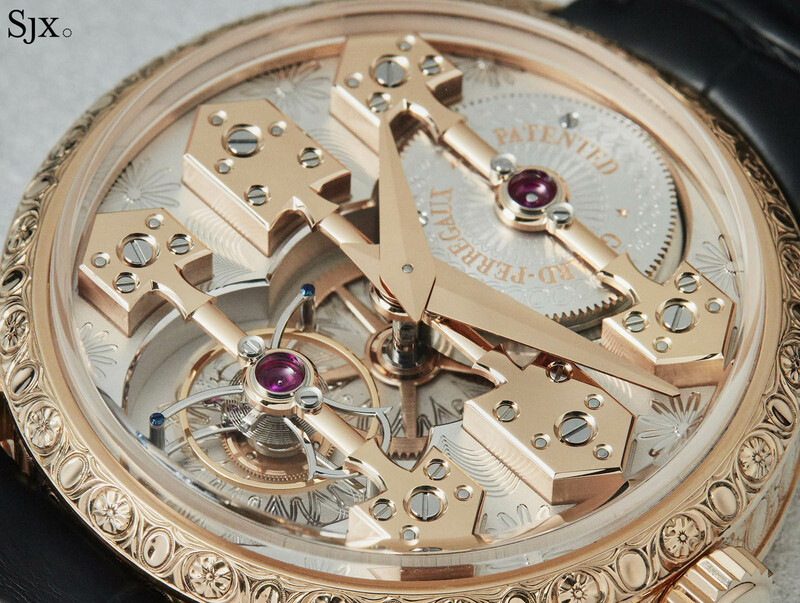 Fortunately the rest of the movement is thoroughly decoration by hand, including the mirror-polished solid gold bridges that boast rounded arms and pronounced bevelled edges. The countersinks for screws and jewels are also mirror-finished, while the spokes of the wheels have wide, polished bevels. An especially charming detail are the large, screwed chatons for the jewels that hold the barrel and tourbillon pivots, just as it was on the original pocket watch. 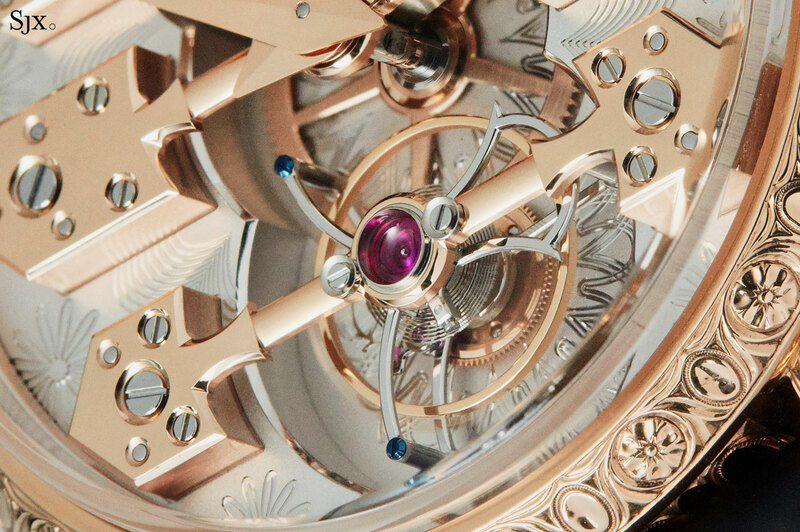 The signature tourbillon carriage is made up of 80 parts but weighs just 0.305g. Protected by a sapphire crystal and usually hidden under the hinged lid, the back of the movement is what would have been under the dial on “La Esmeralda”. Here it’s been decorated with various elements drawn from Girard-Perregaux history, most obviously the trio of gold bridges inspired by the bridges in the brand’s earliest tourbillon pocket watches. 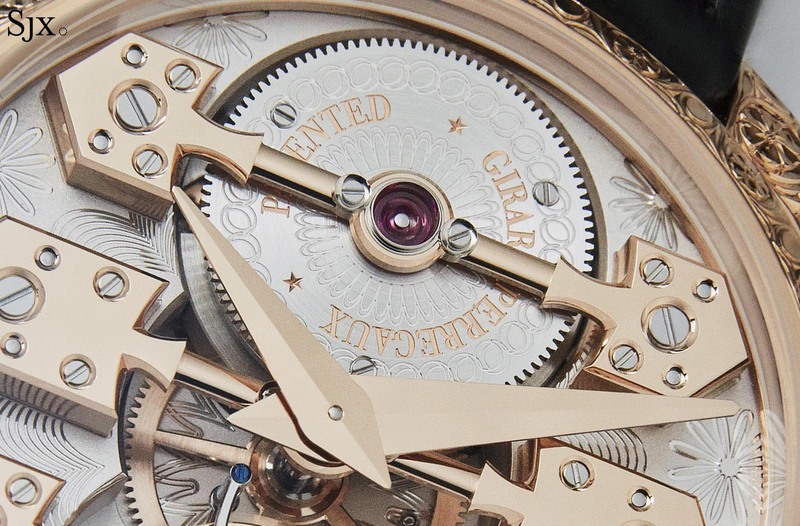 The barrel ratchet wheel has been open worked in the form of Girard-Perregaux’s tourbillon cage, while the winding click is shaped like those commonly found on grande sonnerie movements. And the main plate is finished with a striping inspired by the decoration on the plate of “La Esmeralda”. Even on the back, the decoration is executed to an extremely high degree. 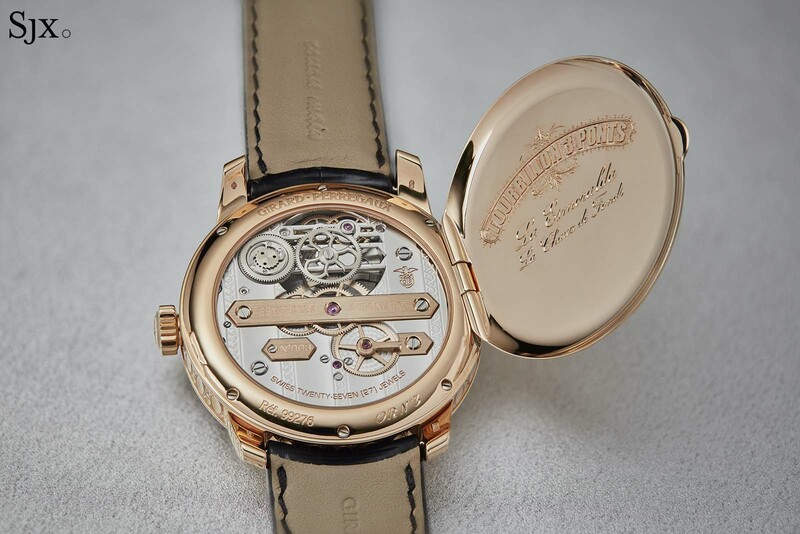 The main plate above the automatic winding mechanism has been open-worked – echoing the shape of the gold bridges – and featured polished, inward angles with a mirror-polished surface. 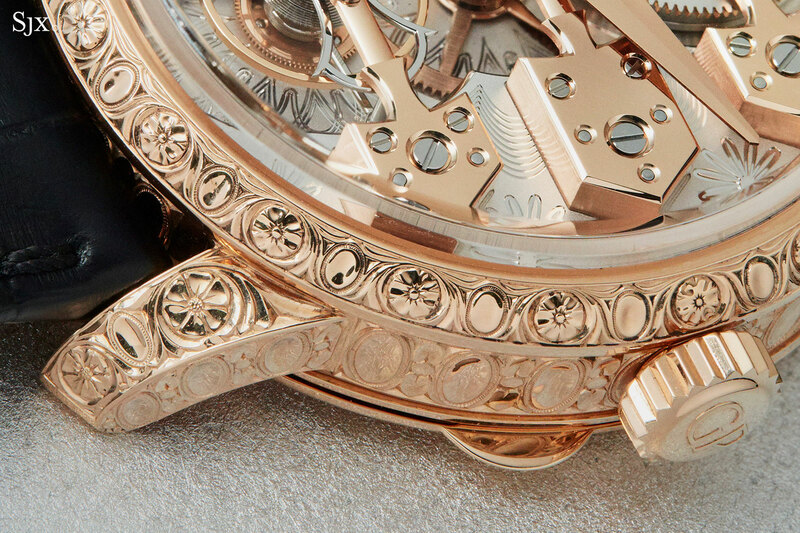 The engraving on the gold bridges, however, is done by machine, which gives it an evenness slightly out of sync with the lavish decoration on the rest of the movement. The Girard Perregaux La Esmeralda Tourbillon “à Secret” (ref. 99276-52-000-BA6E) is a one-of-a-kind creation, priced at SFr259,000 or S$366,000.